• Two 5" wheels easily mount onto each table half for transporting. • Requires only six inches for storage, the most compact in our line. • Open the box, pull out the legs, put on the net and you're ready to play. Our prices on tables include shipping to many locations. Shipping to some locations may require an additional fee. If so, we will contact you before we process your order so that you may approve the additional fee. Note that freight shipping is expensive; therefore, when comparison shopping, be sure to check whether shipping is included. 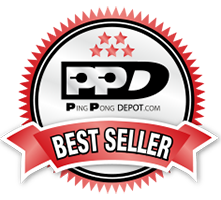 We guarantee that we have the best prices of any table tennis retailer.